I guess one of the more obvious reasons why people think that the CPI is inaccurate is the weights involved in its construction. And since there's a large cross section of population (its supposed to represent the Malaysian demographic distributed across different geographic areas...i.e. some households do have to spend on education, while others don't), the CPI kinda gets distorted heavily. Malaysia has a one-in-five year Household expenditure survey to give our CPI basket its weight by generic category. 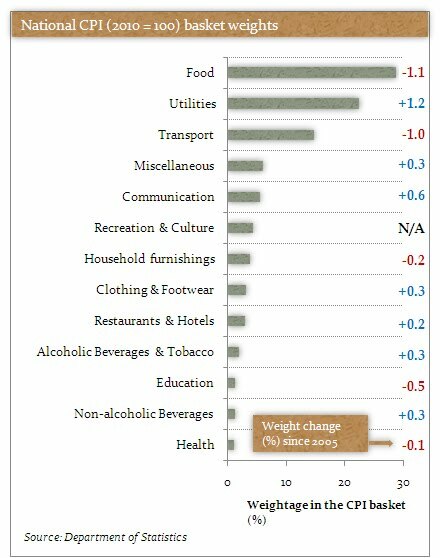 Anyway, it wasn't that much of a significant change in the weightage, it shows that Malaysians on average still spend two thirds of their income on food, utilities and transport. The changes (theoretically, anyway) reflect Malaysian's consumers for more durable, non-necessity goods as the economy starts to improve. Whether the weightage or the measurement of the index is inaccurate is still up for academic debate, as Bank Negara's assistant governor, Dr. Sukhdave Singh in a press conference, has reiterated that Department of Statistics' calculations are in line with global standards....having said that many people all over the world question the inflation methodology as well...so hmmm.